20th December 2012. Find out about more new site improvements, details of the Hema Maps App, our Xmas closure dates & details, plus get the latest Super Specials from our online shop. Christmas is fast approaching, and this is the last ExplorOz Newsletter of the year. There's lots to do on ExplorOz to keep you busy if you're home for a break - why not do some "house-keeping" and add your personal reviews or photos to Places you've been (even if a very long time ago), or write a blog, or upload some User Treks from your past trips, or just spend your time browsing and reading articles and treks for inspiration! When you run a search in this massive database or even select a State or Place Type to browse, you have the option of how you'd like to view the results - chose to view them on a map, or view by text. If you choose to View by Text the default is Best Match (in alpha order by Place Name). However, you can now change the sort order of the list - giving you the option to sort by Created Date, Updated Date, or Highest Rating. The text list also gives a bit more useful information at a glance for each Place, including icons to indicate facilities (hover for description), plus the user-rating score. This makes it easy for you to skim your eye down the list before selecting a Place you wish to open. Don't forget that ALL Places in the database have the GPS position, all can be viewed on either a topo map, satellite map or hybrid map and because we use vector data, you can zoom in to see greater detail. If you're a Member you can download the GPS positions (or add to MyPlans for batch download) - free of course. We've also upgraded the Regions database by using the full set of official tourism region names, which should help you when cross-referencing from tourism booklets. We are seeing many ratings and quality reviews being submitted by our audience on a daily basis for all sorts of Places from Caravan Parks & Free Camps, to all sorts of other Points of Interest that are deliberately selected for relevance to adventure travellers, so there's no better place to look for inspiration than ExplorOz Places - with over 85,000 listings and most with photos, descriptions, and reviews shared by other travellers. Plan, navigate and share your next off-road adventure on your iPhone or iPad with 4WD Maps. 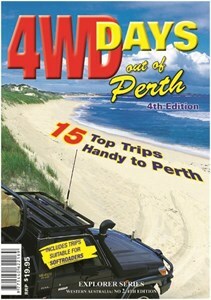 Whether you're a local, or you're planning a WA trip for 2013, these are must have 4WD titles! View the entire Westate range here. Keep your eyes protected this summer with a pair of stylish and affordable Sunwise Sunglasses. Microfibre Pouch and Tough Case with every pair. This year, the I.T. Beyond administration office in WA will be closed from COB tomorrow, Friday 21st December and will reopen on Monday 7th January 2013. No enquiries can be handled during this time. However, this closure does not effect processing and dispatch of orders made online through our shop because this is handled by our warehouse staff. Order packing & dispatch will occur every trading day from our SA warehouse (ie. closed for public holidays). Please be aware that only payments for Orders/Invoices/Classifieds/Membership made by credit card or PayPal can be processed during this time. (Any direct deposit, cheque, or money order payments require the I.T. Beyond administration staff to manually cross-reference your payment so cannot be actioned until we reopen). Forum operations will also continue as normal, thanks to the Volunteer Member-based ModSquad.